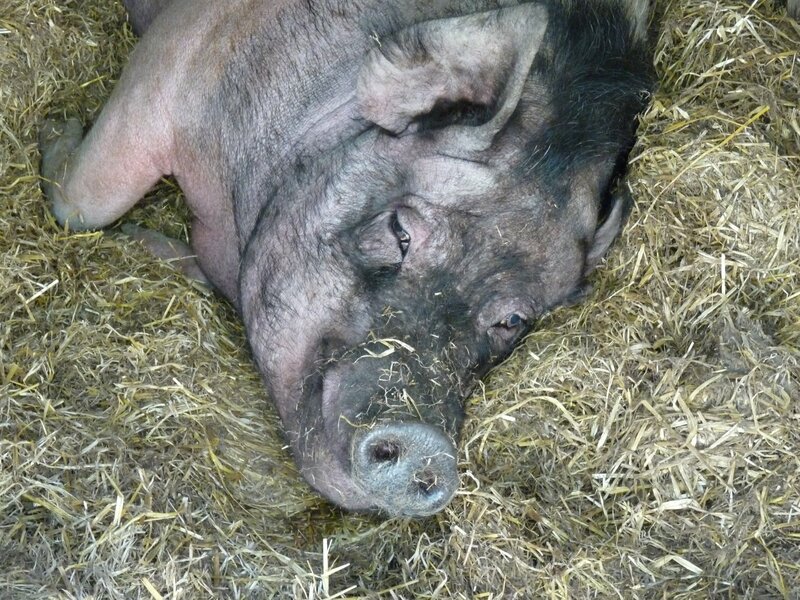 3VV have arranged for a group of us to visit the Pigs in the Wood pig sanctuary in Denby Dale, West Yorkshire. 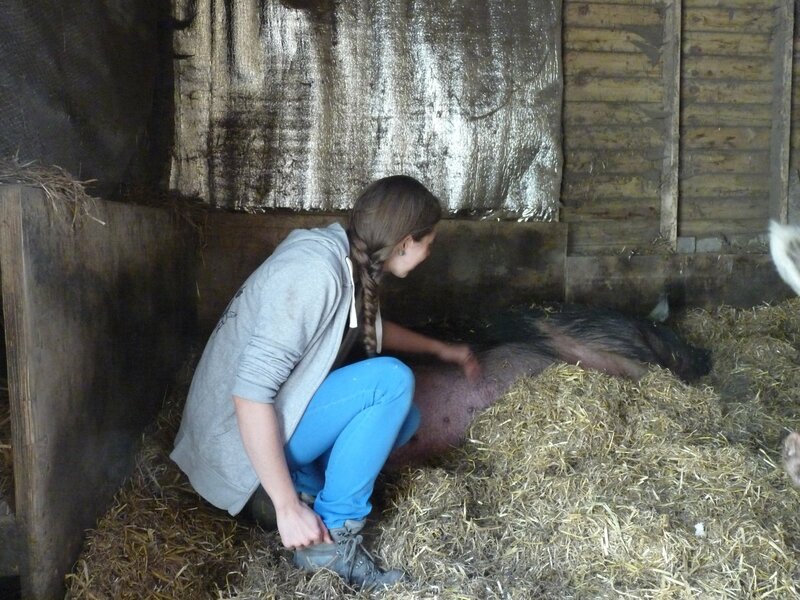 This is a sanctuary for pigs that promotes veganism and provides talks to schools and groups about pig welfare. 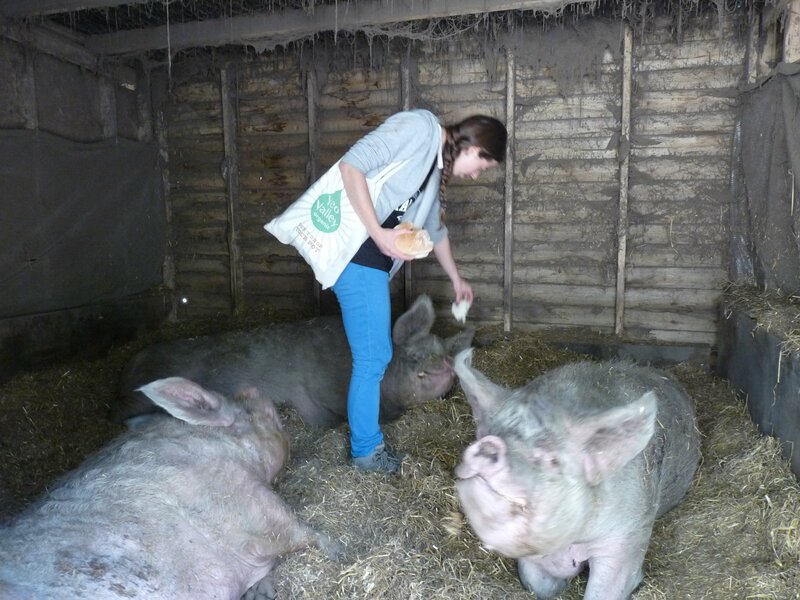 The visit will involve meeting the pigs and observing them behaving naturally in their environment. 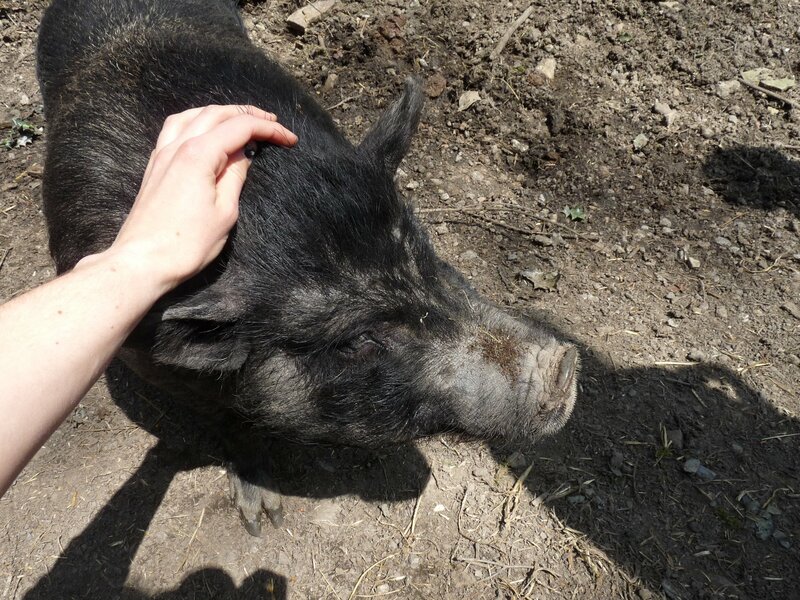 We may be able to feed and or massage the pigs and have a walkabout in the woods with the pigs (if the pigs want to!). 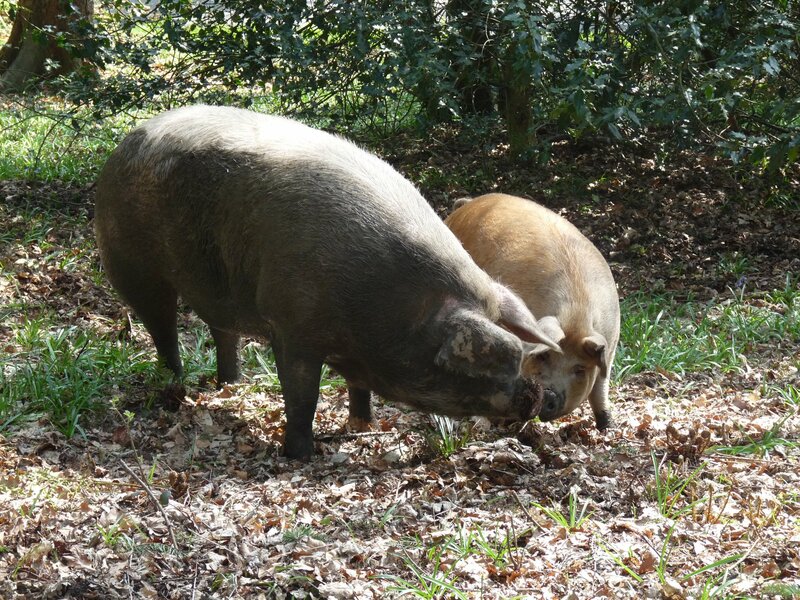 We’ll be provided with information about pig welfare and may even be able to have a picnic in the wood with the pigs (weather permitting). It’s going to be (very) muddy so wear suitable footwear e.g. wellies. 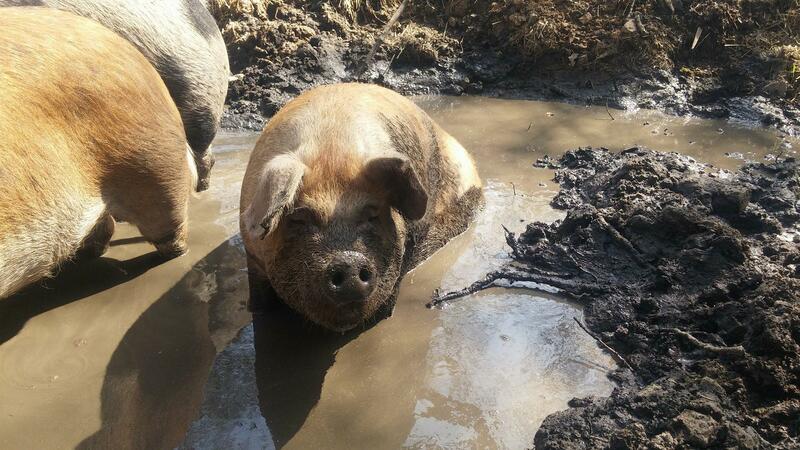 The sanctuary needs funding to keep going so there is a minimum donation of £5 for adults. Please bring a vegan lunch and drinks with you for our picnic. We’re meeting at the sanctuary at 10.30 and will be going by car. We’d like to car share so if anyone is happy to drive then please let us know. 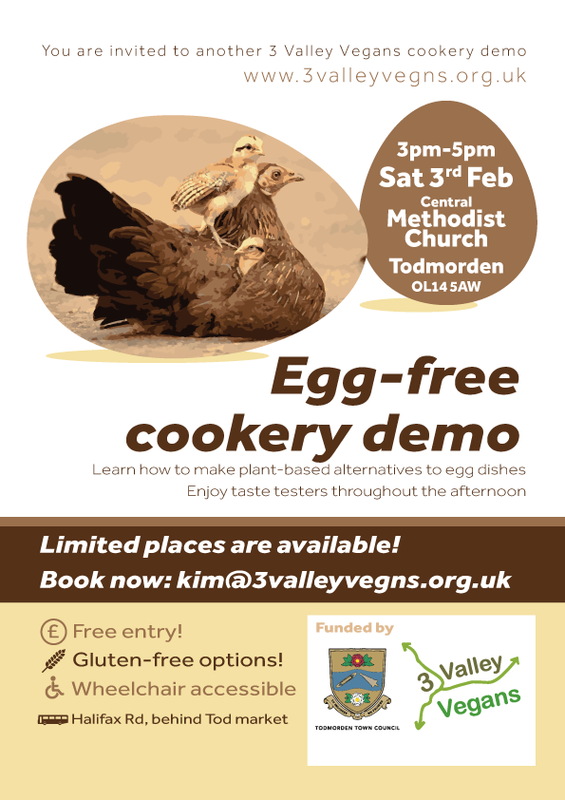 We’ll be leaving Todmorden at 8.45 am. and Hebden at 9.00 am. 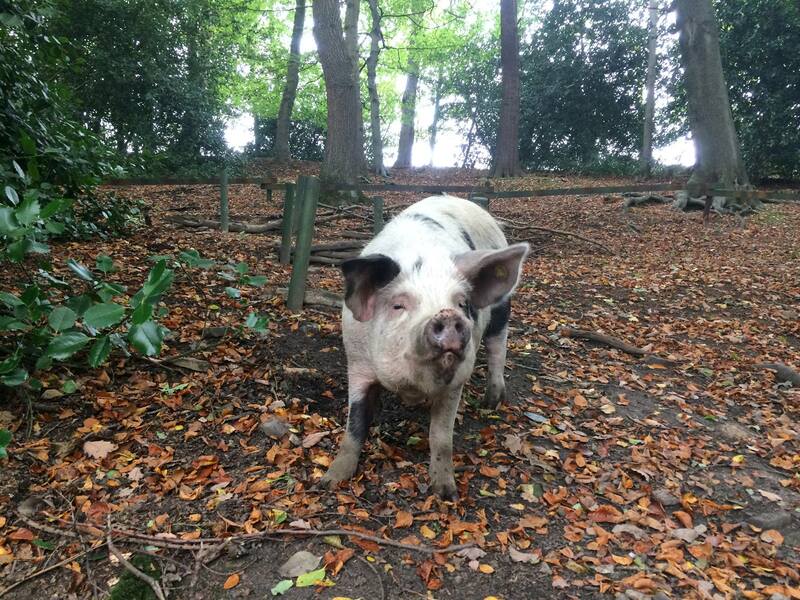 If anyone would like to make their own way to the sanctuary the address is: Highbridge woods, Wakefield Rd, Scissett, HD8 8SZ. 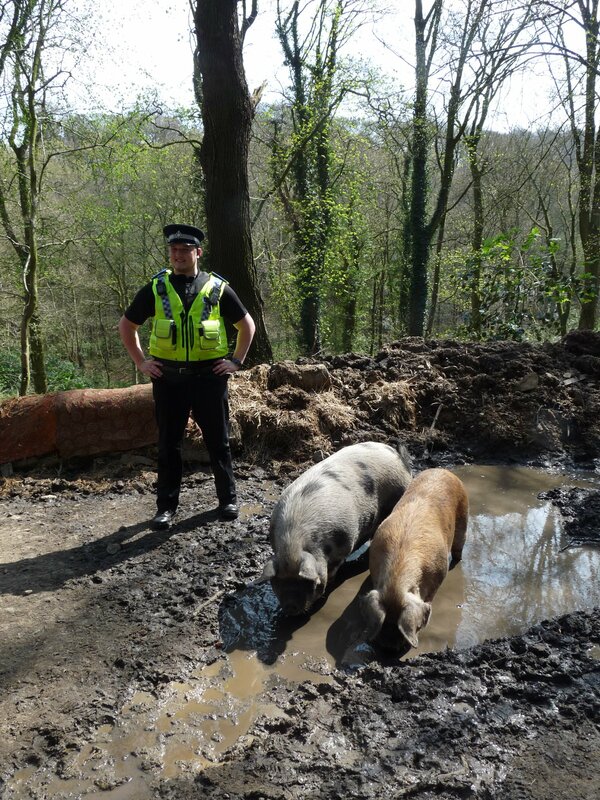 Booking is essential as we need to let Pigs in the Wood how many of us there will be. Email us to book a place. 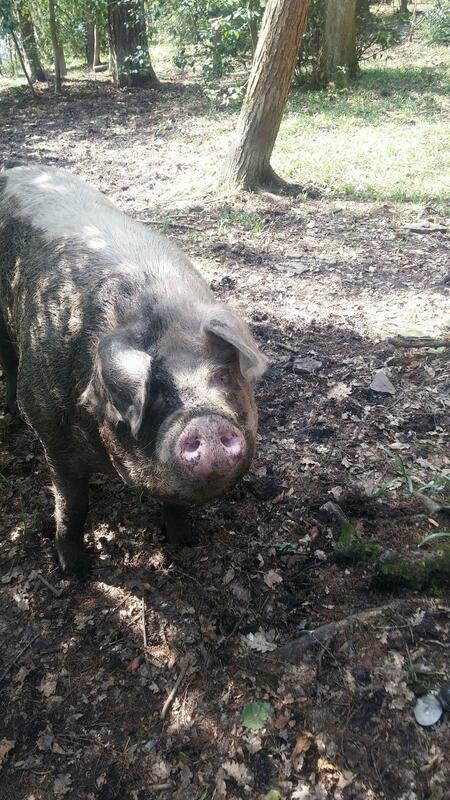 See the Pigs in the Wood Facebook page for more information about the sanctuary. Thanks to Kim for the photos of the event, above, and Rob, below. 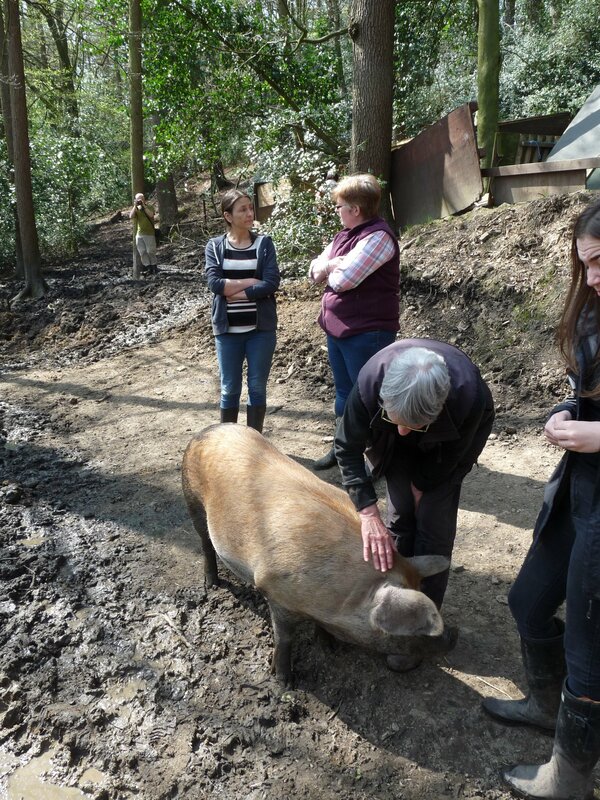 We met two new, shy but inquisitive pigs called Lottie and Dottie. They were very interested in meeting us but did not want to come too close. 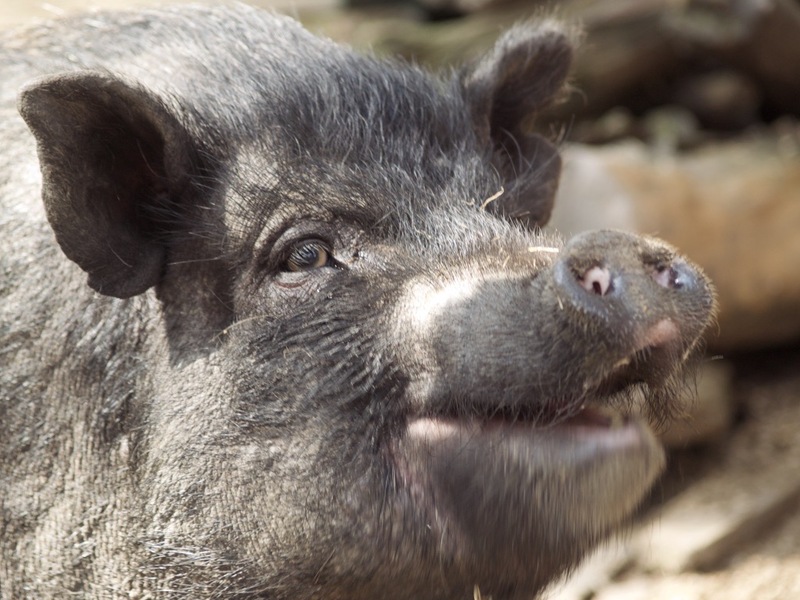 They have been given the opportunity to flourish somewhere they can feel safe. 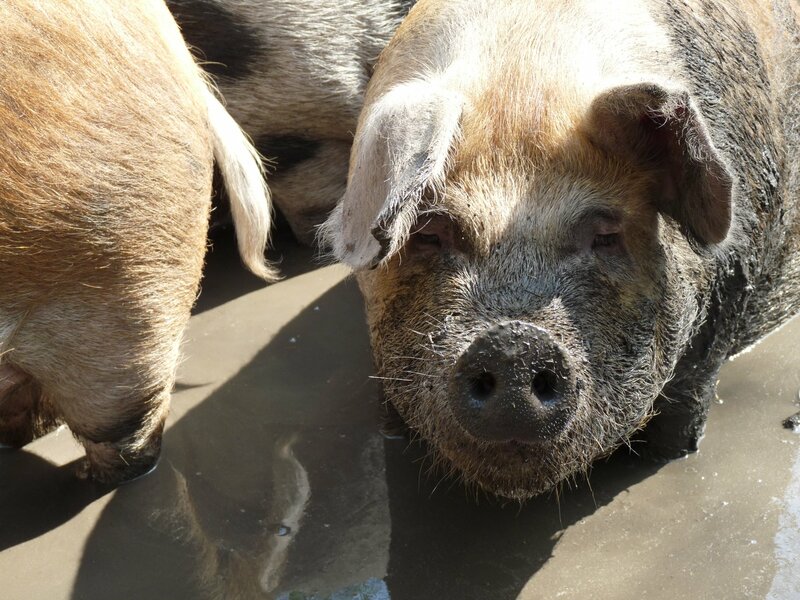 We have proudly adopted them and feel privileged to be able to help them settle in their new home. 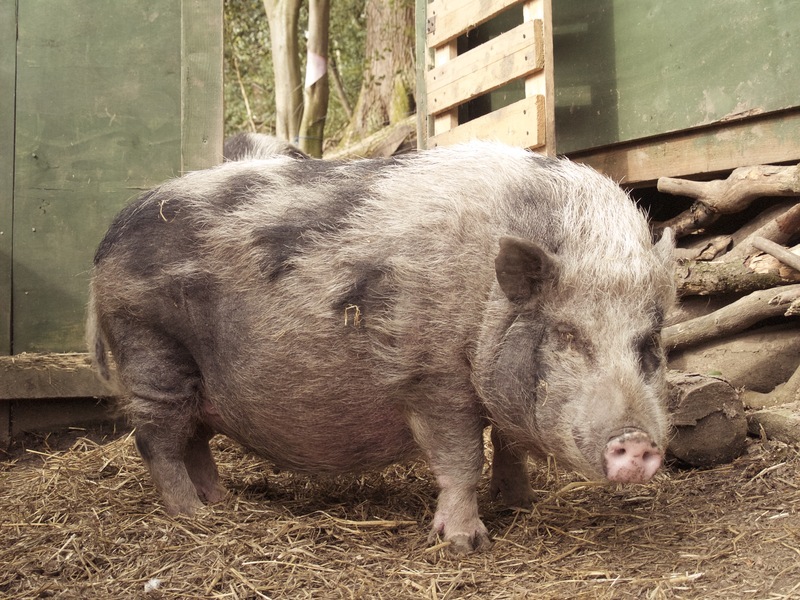 Help by donating to Pigs in the Wood.